The use of olives originate from Ancient Greece. Olive oil had 3 main uses -- medicine, skincare and food. Scientist have long proved that olive oil has superb nutrients which is good for the body. The Greeks used olive oil to massage their entire body after shower. The Ancient Egyptions mix in heated olive oil with jasmine, rose, herbs and other aroma. They wash in cold water then in hot water, this way the scent lasts longer. After a sun tan, it's beneficial to put some Extra Virgin Olive Oil on to prevent damage caused by UV rays. Extra Virgin Olive oil is different from sunscreen, but it contains Vitamin E and other anti-oxidant ingredients which can help repair damaged skin. 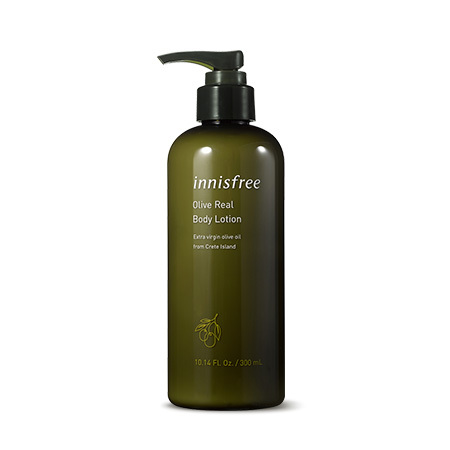 The Innisfree Olive Real Body Lotion contains organic olive oil, jojoba oil, which provides hydration, deep moisture and nutrients to the skin. Although it used 2 types of oil as ingredients, but it doesn't feel oily at all! It helps lock moisture on the skin and absorbs super quickly! It also contains herbal essence to give your skin radiance. Apply it on your skin after shower, the long lasting elegant olive smell keeps you relaxed and away from stress! The price is ok... 1 bottle lasts a few months if you were to use it daily. There are many other brands that costs more expensive.